San Luis, AZ (USA) -- It seems that as long as there has been art, there have been artists eager to use their creative expression as a tool of faith. Sometimes this manifests in a richly colored stained-glass depiction of Christ’s ascension, as in the cathedral of Le Mans. Or the lavish religious-themed frescoes in the Sistine Chapel. Then there are the artists who dedicate their careers to affixing crucifixes to anything that remains stationary for more than a few seconds. Locals drawn to these sacred expressions, steeped in generations of tradition and history, might want to pay a visit to ARTS Space Obispo which, for the month of May, will be exhibiting Tibetan sacred paintings—called thankas—made by Karma Thupten, a resident of Nepal. That Thupten is visiting, and exhibiting in, San Luis Obispo is attributable to a long and unusual sequence of events. Twenty-eight years ago Melanie and Robert Sachs, San Luis Obispo residents who practice Tibetan Buddhism, commissioned Thupten to paint a thanka for them. After their initial interaction, Thupten remained in contact with the Sachs. They sent secondhand clothes to Nepal and he would send paintings in exchange. In recent years, Thupten increased the flow of paintings to the United States, asking the Sachs to sell the thankas on his behalf. Financial transactions are an everyday aspect of life for an American artist but Thupten’s background adds a decided layer of complexity to the mix. Within thanka painting there are many different traditions; Thupten paints according to the Karma Gadri style, the second-oldest school of thanka painting, which dates back to the 15th century. Traditionally, Buddhist monasteries supported thanka painters by financing their work. The artists were never actually paid for their art; monasteries instead provided the artist with gifts that would support the artist’s family. When China invaded Tibet in 1959—Thupten was 5 years old at the time—the invaders began an effort to exterminate Tibetan culture and replace it with Chinese customs and traditions. The monasteries, and the established system of support for artists, were destroyed. Before the Chinese invasion, Thupten’s family made a living raising yak, sheep, and goats. But they escaped to Nepal and later, India after the invasion. After nearly two decades of wandering as refugees, Thupten’s family permanently settled in Kathmandu, the capital and largest city of Nepal. Despite the fact that Thupten had been passionate about painting from the time he was a child, it was in Kathmandu that he began his journey as a sacred artist, learning from Tibetan artist Rinchen Norbu for one year and Tsetin Tashi for five years. Thupten now owns his own studio in Nepal, the Land of Snow Traditional Thanka Painting School, but even that does not ensure enough trade to support his family, or ensure the survival of his artistic tradition. A decade-long civil war and violent political unrest has seriously damaged the country’s tourist industry, an important economic base for thanka painters like Thupten. Recently, Thupten’s relative, Tsering Topgyal, moved from Nepal to New York to San Luis Obispo; he decided that he did not like living in New York and when the Sachs invited him to California, Topgyal accepted. Then, in April, Melanie was musing that it would be a great opportunity to exhibit Thupten’s paintings in San Luis Obispo when she learned that ARTS Space Obispo had an available slot in May. She called Thupten, despite the fact that the odds were against the possibility that he could secure travel papers in a mere two weeks. But as luck—or something less random—would have it, Thupten had scheduled and prepared to visit one of his American students, but the event had fallen through. On April 28 he arrived for his first visit to the United States, and on May 2 he was the guest of honor at a very crowded arts space. The dozens of thankas at ARTS Space Obispo, and the drawing workshop Thupten is hosting on May 23, are part of the effort to ensure that this centuries-old tradition grows older still. Like many other cultural traditions of religious arts, the content for thankas is based upon descriptions provided by both a holy book and spiritual figures, who are called Lamas. Most thankas depict various deities, past and future Buddhas, and faithful disciples. There are hundreds of such figures—21 versions of the female Buddha Tara alone—and it is the artist’s responsibility to confer with a Lama to ensure that the deity is the correct color, has the proper number of arms, and is identified with the right symbols. For example, one of the pieces in the thanka exhibit depicts Sangye Menla, otherwise known as Medicine Buddha. This particular Buddha must be depicted holding the arura plant in his right hand and a bowl containing a healing elixir in his lap. He is blue. His mantra, which is displayed beneath his image, is TAY YAH TAH OM BEH KAHN DZEH BEH KAHN DZEH MAHA BEH KAHN DZEH RAH DZA SAH MOOD GAH TAY SOH HAH, a recitation intended to cure ignorance, attachment, and aggression. The many Buddhas and deities make for a colorful and varied display: red, black, blue, white, and green. Their facial expressions range from serene to wrathful. 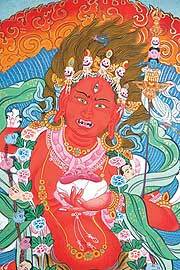 One of the most well known female Buddhas, Vajrayogini, is generally depicted with ornaments of bone, dancing or drinking blood from a skull cup. According to Melanie, many Tibetan Buddhists commission a thanka for a particular deity because of the benefices associated with that figure—wealth, love, physical health. Non-Buddhists, or people less familiar with the deities, may choose to purchase a particular thanka simply because it speaks to them, in much the way any piece of art would. But that doesn’t mean that a thanka can be displayed in the same manner as a ubiquitous Van Gogh print. It’s considered impolite to display a thanka in the restroom. Creating a thanka requires deliberation and attention to tradition. A piece of material—cotton in Thupten’s case—is hemmed around the edge and then attached to a wooden frame. The canvas is then layered with whitening mixed with buffalo hide glue and polished with a piece of glass. The artist then creates a sketch to establish the perfect proportions. Then, black ink is applied over the sketch outlines. The image must be painted in a particular order, beginning with the sky, ground, a halo or flames, body, clothes and flowers. Some artists then apply powdered gold paint to the piece using an agate tool. Many pieces, including a few of those at ARTS Space Obispo, are then placed in a brocade frame, vibrantly hued in yellow, blue, and red. After the work is complete, the artist presents it to a Lama to bless the piece and to request forgiveness for being obliged to sell the thanka. Obispo is located at 570 Higuera Street, suite 165.